The archive of Nobel Prize-winning author Gabriel García Márquez opened today for research at the Harry Ransom Center at the University of Texas. The humanities research center agreed to pay $2.2 million for the archive of the late Colombian author last year and announced the acquisition in November. The author, who lived in Mexico City during his later years, is best known for such acclaimed novels as “One Hundred Years of Solitude” (1967) and “Love in the Time of Cholera” (1985). He died in April of 2014 at the age of 87. “This archive, strengthening UT’s world-class humanities collection, not only offers research opportunities to our students and to Texans, but will attract a global research community to Austin,” said UT President Gregory L. Fenves. 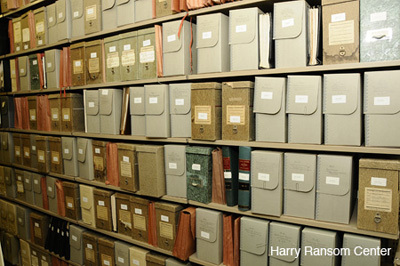 The archive contains more than 75 boxes of documents, and researchers will have access to manuscript drafts of published and unpublished works, correspondence, 43 photograph albums, 22 scrapbooks, research material, notebooks, newspaper clippings, screenplays and ephemera. I couldn’t help but think these materials of the author may be a national treasure which Colombia should get first dibs on or even Mexico since the author lived there. I’m guessing his work was originally written in Spanish and translated into other languages, so a Latin American sponsor would make more sense. But perhaps those avenues were attempted and no one could do the author’s collection justice. I would have liked the article to touch on these concerns. Oh well.